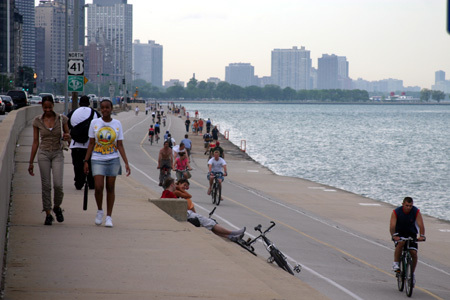 The lakefront is special because it is a prized place shared by all Chicago residents. Although major divides still exist between neighborhoods, the path system unites differing ethnic and socioeconomic neighborhoods - such as Southshore, Hyde Park, Lincoln Park and Lakeview - serves as both a recreational and transportation resource to them all. In riding to a soccer field, a public beach, or to one of the free music festivals downtown, path users make the lakefront into a true public place: somewhere to to see and be seen, to rub shoulders with neighbors and strangers alike. On a typical day one can see crowds of people swimming, walking, biking, playing chess at path-side tables, buying food and drinks from vendors, relaxing on rented beach chairs (with umbrellas), or having a meal at an outdoor restaurant overlooking a little league game. Chicago's Lakefront Path is ann 18-1/2-mile linear park along Lake Michigan that includes beaches, volleyball courts, playgrounds, baseball diamonds, tennis courts, and soccer fields. Easily accessible, with great views of the city's skyline (north, south and west), the bike path widens in the downtown area to include space for outdoor concerts, such as annual blues and jazz fests. 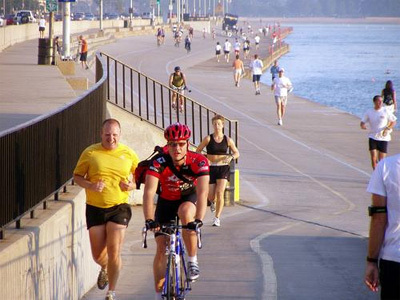 Special events, such as road races, running races, and bike events are held along the lakefront path during the spring and summer season.